Mr. Anwar and Ms. Xu are fourth year medical students at the SUNY Downstate College of Medicine in Brooklyn, NY. Dr. Siegel is a Clinical Professor of Dermatology. Coleman Jacobson MD, a larger than life figure in twentieth century dermatology, played a role in one of the most memorable and tragic periods in world history. While details have been accessible on the web for over a decade, new findings regarding the Warren Commission are now finally being presented to the dermatology community from Dr. Jacobson’s perspective. Jack Ruby, the man who assassinated Lee Harvey Oswald, was both a friend and patient of Dr. Jacobson1. Shortly after additional files of the Warren Commission were released circa 2003, one of this paper’s authors, Dr. Daniel Mark Siegel, came across several files pertaining to Dr. Jacobson. The two had originally met at a monthly meeting of the Dallas Dermatologic Society in 1982. Dr. Jacobson was looking for volunteers to help with the Dowling Club’s first visit to North America. Dr. Siegel, a first year resident in Dermatology, proffered his time for the opportunity to work with the renowned physician. 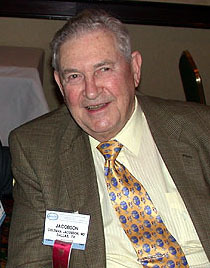 Jacobson served as a mentor to Siegel for many years. They became close personal friends over time. After discovering files from the Warren Commission relating to Dr. Jacobson, Dr. Siegel approached his mentor. He suggested that an article about Dr. Jacobson and his role in this historical event would provide the foundation for a great read for the historically minded dermatologist. Dr. Jacobson asked Dr. Siegel to delay pursuing this endeavor until after his death. His wish was respected2. During their ensuing discussions, Dr. Jacobson revealed that he was the only person other than their Rabbi to visit Ruby in prison1. He noted that Ruby got delusional on several occasions. One day, Dr. Jacobson brought Ruby a notebook, which Ruby filled and returned to him at his next visit. Dr. Jacobson state he brought the notebook home, stuck it in a drawer and did not recall what happened to it2. While that writings in that notebook may never be uncovered, the now public files of the Warren Commission coupled with Dr. Siegel’s discussions with Dr. Jacobson, provide an added layer of insight into the underpinnings of one of the most tragic days in American history. When the final report was released to the public in September 1964, much of the background material was locked away at that time. Under the auspices of the JFK Act, all records from the Warren Commission will be released in 20171. Political controversy and misgivings swirled around the entire investigation, and remain to this day. What lies beneath the surface is a story of untold emotions, questionable motives, and truths that may never be fully uncovered even after all the dust supposedly settles1. Coleman Jacobson was born on April 18th, 1921 in New Haven, Connecticut. During World War II, he joined the U.S. Air Force. During a mission, his B24 bomber was shot down. He subsequently served as a prisoner of war for two years in Germany. His service earned him an Air Medal, a Purple Heart, and the rank of 2nd Lieutenant. In 1944, he married his college sweetheart, Ruth. On his release and discharge from the army, he was accepted into medical school at the University of Iowa where he received his M.D. in 1949. He completed his dermatology training at the University of Pennsylvania in 1951. On his way to Phoenix, Arizona he stopped in Dallas where he founded the North Dallas Dermatology Clinic at 3707 Gaston Avenue. He spent his entire professional career in Dallas3. Outside of medicine, Dr. Jacobson had an eclectic range of interests2,3. His love of travel turned into an opportunity to serve developing nations. He founded and helped operate clinics throughout Africa: Ethiopia, Kenya, Tanzania, and South Africa. His tireless dedication in the treatment of leprosy, HIV, and parasitic infections of the skin was recognized by the American Academy of Dermatology in 2006 with a lifetime achievement award. Other interests included history and geography; his love of teaching resonated with medical students, interns, and residents. His friends and colleagues adored his witty and humorous nature; he was an extremely well read life long learner that shared his love of medicine with all those around him3. He spoke numerous languages and had an uncanny ability to speak to most people in their native language as observed by Dr. Siegel. His boisterous and jovial personality made him well known in the Dallas community; He befriended everyone from Congressmen and Mayors to businessman and millionaire Stanley Marcus2. Dr. Jacobson was Jack Ruby’s dermatologist; his clinic notes and interviews released from the Warren Commission records provide insight into the events that later unfolded3. Jesse Curry, the chief of police in Dallas, was instrumental in the ensuing investigation. A confidential informant’s statement in the Warren Commission files revealed that both the FBI and a private investigator interviewed Dr. Jacobson and noted “that the doctor has known Jack Leon Ruby since 1956 both socially and professionally.” Dr. Jacobson visited the home of Jack Ruby several times; he also visited Ruby at his stripper bar in Dallas, the Carousel Club5. Both of them attended the same synagogue4. Dr. Jacobson commented on their relationship; he claimed to be a “friend of Ruby,” and noted, “he [Ruby] does not drink as he is a religious man.” However, he Ruby is also portrayed as “flamboyant and excitable with no stable emotions.4” The dichotomy in Dr. Jacobson’s portrayals is noteworthy; Ruby seemed to be a multi-faceted man with many personas1. On the other hand, Ruby could be cryptic at times. The two never discussed politics, and Dr. Jacobson could not recall ever meeting any of Ruby’s other friends. Ruby called Dr. Jacobson on the afternoon of Friday, November 22nd, 1963, at around 4 or 5 pm. Ruby asked for the time of the JFK memorial service at the Synagogue. Dr. Jacobson noted, “Ruby did not have his usual ‘breezy’ attitude and normal tone of voice. He [Ruby] seemed upset.3” Ruby was extremely emotional, but appeared to genuinely want to attend the service. When prompted for further details, Dr. Jacobson could not recall anything else from their very short phone conversation1,4. Dr. Jacobson reviewed his medical records to see if anything pertinent could be now identified. He made several realizations after his review. He knew Ruby for eight years, serving as his dermatologist for most of that time period1. Ruby’s primary reason for visits consisted of minor skin irritations such as fungus. On one occasion, Ruby mentioned there was a “metal plate” in his head, but there were not any physical findings to corroborate his claims. Ruby was single and usually invited Dr. Jacobson over for the holidays. Dr. Jacobson described Ruby as a “very pleasant and congenial individual, and insofar as he knew, honorable.” Ruby was “not impulsive, he was very sentimental and sensitive, especially with animals.” Ruby had several dogs, which he loved dearly. He adored children. Dr. Jacobson knew nothing “shady” about Ruby4. In totality, Dr. Jacobson portrays a varied and shifting viewpoint of Ruby through his accounts of their friendship. Ruby showed adoration for children, portrayed humility in many of his actions and even invited Jacobson over for the winter holidays4. Nonetheless, Ruby revealed very little about his personal life, including his operation of a nightclub. Sparse details are available regarding this nightclub in the files of the Warren Commission, however more can be found in the lay press5. Amidst all of this, it is notable that a perusal of the Warren Commission report and supporting documents reveals Ruby often carried a gun. This was due to the fact that he often carried cash from his club and need protection. Dr. Jacobson repeatedly stated that he did not ever suspect Ruby to be capable of foul behavior. Nonetheless, it is important to note that many Texans commonly carry guns legally. The last time Dr. Jacobson saw Ruby prior to the assassination was in September 19631,4. An analysis of Ruby’s actions reveals several themes surrounding the Warren Commission. Ruby’s actions were significant because he disrupted the legal process of interrogating Oswald. His actions made it far more difficult to determine the motives behind Oswald’s actions. We may never know Ruby’s motivations for his actions; Jacobson’s clinic notes and personal accounts of his interactions with Ruby reveal another layer of insight into the psyche of Ruby. As expected, his persona was multi-layered, and delving into them probably brought up more questions than it answered. The release of the Warren Commission documents to the public reveal the unique insight of a dermatologist at the heart of a decades old controversy. Many layers of the onion remain to be peeled before we get closer to determining if there was indeed a “commission” behind Ruby’s actions. Obituary of Coleman Jacobson, M.D. Biography of Jack Ruby. January 15th, 1964. Report of the President’s Commission on the Assassination of President Kennedy. The U.S. National Archives and Records Administration. July 6, 2015. Siegel, Daniel M. Personal recollections of discussions with Dr. Jacobson. Circa 2003. Coleman Jacobson. Obituary. Published in Dallas Morning News on Apr. 12, 2012. http://www.legacy.com/obituaries/dallasmorningnews/obituary.aspx?pid=156948534. Commission Exhibit No. 2242. FBI. November 29, 1963. Report of the President’s Commission on the Assassination of President Kennedy. The U.S. National Archives and Records Administration. July 6, 2015. Appleton, Roy. Former Dallas stripper recalls Jack Ruby’s club 50 years after JFK assassination. The Dallas Morning News. http://www.dallasnews.com/news/jfk50/explore/20131005-dallas-stripper-recalls-jack-rubys-club-50-years-after-jfk.ece. 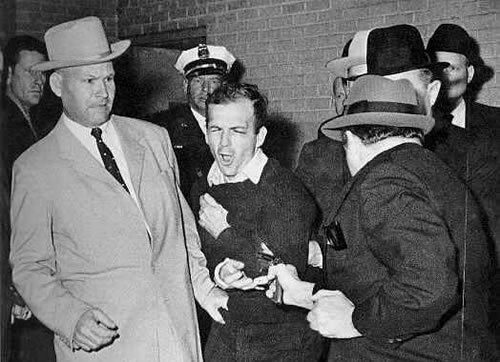 Testimony of Jack Ruby. Report of the President’s Commission on the Assassination of President Kennedy. The U.S. National Archives and Records Administration. July 6, 2015. Warren Commission Hearings. AARC Public Library. Volume XXV. 1-37. This entry was posted in Daniel Mark Siegel, Michelle Xu, Yusuf Anwar and tagged coleman jacobson, daniel mark siegel, dermatology, history, jack ruby, JFK Act, michelle xu, warren commission, yusuf anwar by humanemedicine. Bookmark the permalink.